PRICED $100000 BELOW APPRAISED VALUE! Upscale Florida living at its best is calling you home with the custom built lakefront home with a detached apartment. From the moment you enter the private entry to this home you are engulfed by everything to love about living in the Sunshine state - nature and beauty mature and manicured landscaping old growth oak trees and a tranquil fountain are ever present to welcome you home. 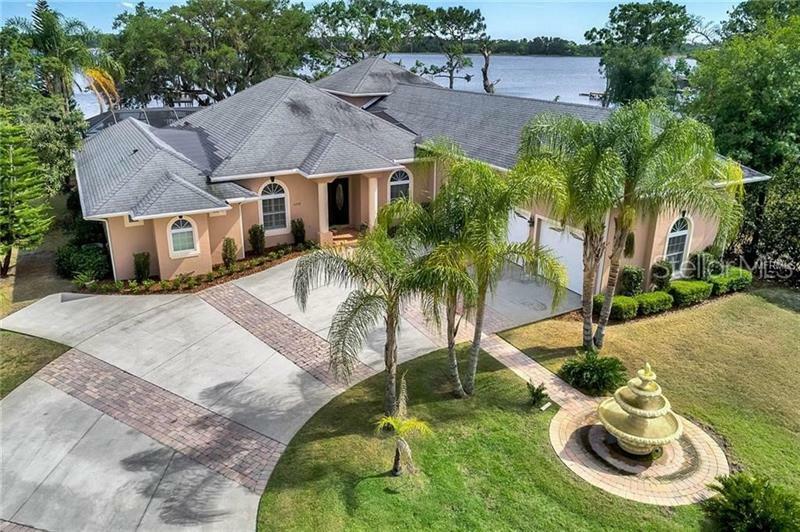 This waterfront estate boasts a main house with a bonus room for fun times and a well appointed private home theatre for the movie or sports enthusiast and the energy efficient home is ideal for relaxing or entertaining. Whether you are sitting in the spacious kitchen looking out one of the many living areas or sitting near the custom koi pond on the back porch you are naturally drawn to the picturesque lake view with a private dock and boat lift. If you are someone that likes having plenty of space then this is the home for you... The main house offers an abundance of storage and includes a three car garage. The detached and fully equipped apartment not only provides a private living space for family friends or guests but also offers an additional oversized three car garage that is the perfect space to store all your toys or work on your hobbies. This home really does have it all - including a safe room... WELCOME HOME! Copyright © 2019 Mid Florida MLS. All rights reserved. The data relating to real estate for sale on this web site comes in part from the Internet Data Exchange Program of Mid Florida MLS. Information provided is for consumer's personal, non-commercial use and may not be used for any purpose other than to identify prospective properties consumers may be interested in purchasing. Assist-2-Sell Ace Full Service Realty participates in the MFRMLS Internet Data Exchange (IDX) program, allowing display of other MFRMLS broker's listings on this site. However may not include all listings currently available. Information is deemed reliable but not guaranteed. Information last updated at 2019-04-21 16:14:09.